Mr. Sethi is the Chief Information Officer, Chief Human Resources Officer (CHRO) & Head Corporate Social Responsibility (CSR) in the company. He also leads innovation efforts in the company. He serves as a Board Member of M/s HMC MM Auto Ltd. (A joint venture of HMCL and M/s Magneti Marelli of Italy). 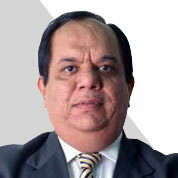 Mr. Sethi has almost 30 years of experience in manufacturing industry and consulting environment. He joined Hero MotoCorp in 2007 and prior to that, he has worked with Ranbaxy and TCS. Rated as India’s Best CIO, he has won several prestigious recognitions including CIO of the year, CIO Hall of Fame, Super League CIO, Champion CIO, Global CIO, Global CIO Hall of fame, Most Influential CIO, Innovative CIO, Most Respected CIO, India’s Best IT Manager, Eminent CIO of India and many others. Mr. Sethi has also featured in the CIO Power List for 2015, 2016, 2017 and 2018. Mr. Sethi has also featured in the list of World's top 50 CIOs, in the list of India's Greatest Corporate Leaders and in the compendium "The Magnificent Heros" - a Coffee Table book. He also featured in the list of India's 50 most talented CSR Leaders.